juniorforsker ved Universiteit voor Hooge en Algemeene Donaldismus te Annedam. “The Ducks are on drugs!” This provocative statement was given early last year (2005) by my esteemed colleague Dr Johaan Hop van de Haavelouw of UHADA in his inaugural lecture as visiting professor at SAD. To no surprise, reactionary donaldists have received Dr Hop van de Haavelouw’s shocking discovery with outspoken scepticism and not even refrained from accusing the good ducktor of scandalistic propensities. With this brief contribution, I wish, however, to bring forward further unassailable evidence in support of his rightful claim. 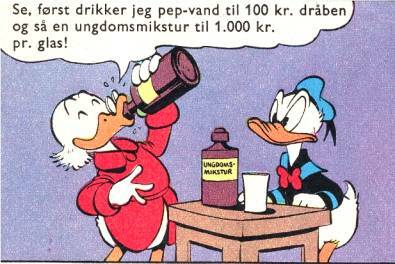 In 1953, and thus several years before the ‘nutmeg-scandal’, Carl Barks documented that already at this early stage Uncle Scrooge is well into the use of energetic tonics of dubious nature (WDC 157). To stay fit and quickly regain his strength, with obvious joy and no shame he gulps down Pep-Water® and a youth elixir at most breathtaking prices. From the whole context, it is obvious that we are dealing with highly expensive and unnatural substances, which are very far from being available to the general public. Most interesting here is, by the way, the reaction of Donald when witnessing his uncle’s use of strength-improving drugs: He finds it repulsive! Indeed, this is long before Donald’s own unfortunate addiction to Gurgleurp®; otherwise, he would probably have asked his uncle for a glass himself (which, of course, his uncle would have denied him, not out of moral concerns, but due to the horrific price on the stuff). Now, connoisseurs of the documentary in question will be likely to argue that the whole scene is something happening in Donald’s dream. I put it to you, though, that the insidence of the Pep-Water® drinking by no means appears to be a product of Donald’s imagination only. 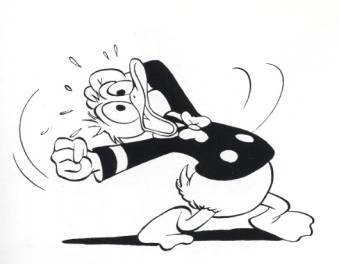 On the contrary, afterwards Donald explicitly tells us (and his nephews) that he only woke up from the dream when his uncle offered him an ice-cream for free; THEN Donald knew it had to be a dream! By this, he implicitly lets us know that the rest of the events are only too realistic. Whether Donald have in fact seen his uncle drink Pep-Water® or not, is actually not the essential question here. Obviously, he finds it most plausible that his uncle WOULD be drinking such tonics - no matter what the price. And Donald is disgusted by it. The taste for euphoriant liquids is, however, nothing new in the world of Ducks. 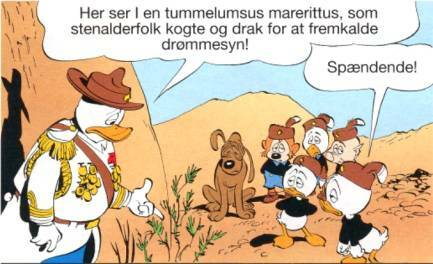 In a recently republished documentary by Carl Barks & Daan Jippes (AA 46/2005), we learn of a toxic plant tummelumsus marerittus growing in the arid wasteland outside of Duckburg, where it in pre-historic times was used by Neolithic Ducks to provoke dreamy visions. Or as we would put it today, give them a major acid trip! Now, some might find it a little bit disturbing that a high-ranking leader of the Junior Woodchucks is teaching the young boys how to make mind-kicking drugs based on the ‘Great Pharmacy of Mother Nature’. If something equivalent took place in the boy-scouts associations of our world, it would most likely cause quite a rumble - if the parents found out about it, that is. But maybe this is in fact another case where we should learn from our superiors of the Duck civilisation. Apparently, the young Woodchucks respond to all this dangerous knowledge and potential temptation with an outspoken indifference! Sure, out of courtesy to their esteemed leader, they politely honour him by saying his information is »Exciting!«, but the looks on their young faces clearly show that they in no way really think so. 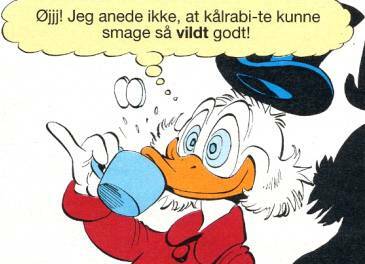 “Drugs are boring”, seems to be the attitude of the Duckburg youth! Yet another impressive achievement by the Junior Woodchucks Organisation. However, not all Ducks look at it this way. Especially one old Duck time and again reveals himself as quite an eager drug epicurean. This time is no exception. 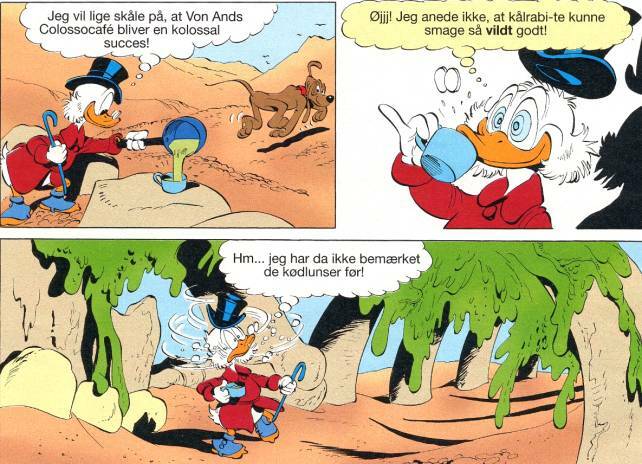 Where narcotic herbs and weeds are growing, good old Uncle Scrooge will sooner or later turn up and make one of his famous “cups of teas”. And even though he this time can be partly excused by the sneaky interference of the troop dog, he obviously finds the new ingredient rather improving for the achieved, overall experience of drinking kohlrabi tea. Quite improving indeed. And if anyone expected the pharma-toxicological level of Neolithic Ducks to be rather crude and primitive, they had better think again. The buzz kicks in immediately, makes your hat and spectacles pop right off, changes the colour and size of your pupils, and leaves a broad, silly grin on your face. Then the world around you starts to spin and bright colours manifest themselves in unbelievable forms before your paralysed, staring eyes. This is the stage where first-time users can be caught in what experts call “a bad trip”. As they are not confident with this new experience, they might start to worry about what is happening, and soon the drug can enhance this negative feeling into a scary nightmare - hence the Latin name of the plant: tummelumsus marerittus. Even for an otherwise experienced user as Scrooge McDuck, the trip can easily get out of hand, and your promising settings for a lucrative café suddenly turns into a big, green, Duck-eating monster.